Fat isn’t the problem. Dieting is the problem. A society that rejects anyone whose size or body shape doesn’t meet an impossible ideal is the problem. A medical establishment that equates “thin” with “healthy” is the problem. 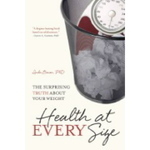 This is a book with helpful messages that anyone concerned about womens healthy weight and living— or anyone else’s, for that matter — can really use.